Closely Knit takes the guesswork out of knitting for others. Gift giving is made simple with the 30+ patterns, each tailored for a specific recipient and organized by complexity. Readers can now accurately estimate the time required to knit a gift for that special someone and with the wide array of options from special hand knits for mothers to knitted sweaters for men, to accessories such as scarves and hats, the gifting options are limitless. In addition, there are stuffed animals, a selection of home dcor items including pillows and blankets and a mobile for baby. Options are provided for creating last-minute gifts in addition to tips and tricks for quick fixes to avoid the cram knitting that sometimes occurs when knitters are creating a gift for someone else. 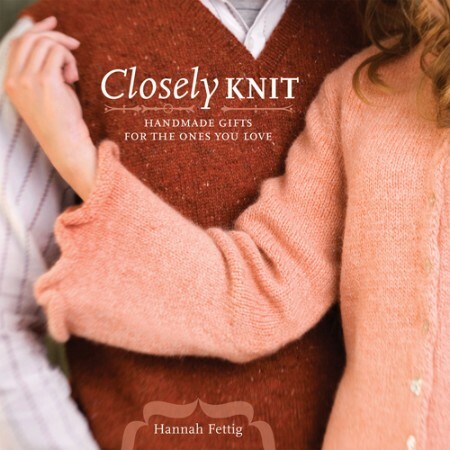 Hannah Fettig knits, sews and designs knitwear. She works for Knitwit Yarn Shop in Portland, Maine where she holds open workshops for advanced knitters. Hannah also designs knitwear for The Fibre Company. Hannah enjoys working with interesting blends, and her knit pieces reflect a boutique sensibility. Before working at the yarn shop, Hannah owned and operated a photo studio for six years, where the bulk of her work was shooting weddings. Knitting gave her relief from the stress of weddings, and at the end of her 2005 season, she decided to "retire" from photography to focus on knitting.